PRONG Stream New Single "In Spite Of Hindrances"
PRONG released their latest album X-No Absolutes worldwide through SPV/Steamhammer on February 5th, 2016 as a Digipak (incl. bonus track + sticker), Double LP Gatefold version (red vinyl, CD in paper sleeve) and as download and stream. The album entered the official album charts in Germany, the USA, Belgium and the UK. Today the band has released a lyric video for their new single "In Spite Of Hindrances" and you can check it out below. 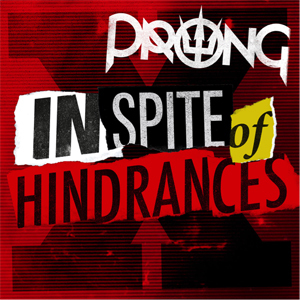 "PRONG is excited to announce a new single and lyric video for the song "In Spite Of Hindrances", from our X - No Absolutes" Album. You can follow and absorb the strong words, which celebrate overcoming obstacles, taking initiative and personal responsibility. Watch it first thing in the morning and throughout the day and night!" PRONG spent the better part of October and November trekking through Europe with OBITUARY, EXODUS and KING PARROT as part of the "Battle Of The Bays" Tour. They will finish off the run with some select shows with EXODUS and KING PARROT, a headline show in Karlsruhe and the Bang Your Head Festival in Luxembourg.